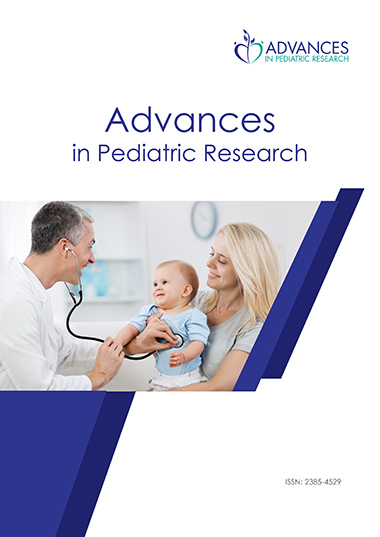 Advances in Pediatric Research is a peer reviewed and open access journal dedicated for a potential impact in pediatric research focusing on clinical practice and research in Pediatrics. Advances in Pediatric Research publish original research articles, review articles, case reports, commentary, letter to editor, etc., in all aspects serving all those involved in health care to diagnose and treat disorders in infants, children, and adolescents. The journal also covers basic sciences and experimental work, and provides a broad academic platform for the international exchange of medical results by following publication criteria based on high ethical standards and the rigor of the methodology and conclusions reported. The journal launched in November 2014. Advances in Pediatric Research is indexed by Google Scholar and Directory of Open Access Journals (DOAJ). In PubMed: Selected citations only. National Library of Medicine ID:101659416. All articles published in Advances in Pediatric Research are ‘open access,’ meaning that they are made freely and permanently accessible online immediately upon publication, without subscription charges or registration barriers. Authors of articles published in Advances in Pediatric Research are the copyright holders of their articles. However, the ‘open access’ policy implies that authors grant to any third party the right to use, reproduce or disseminate the article, provided that no substantive errors are introduced in the process, proper attribution of authorship and correct citation details are given, and that the bibliographic details are not modified. If the article is reproduced or disseminated in part, it must be clearly indicated. The basic article processing fee or manuscript handling cost will be according to the price mentioned above and on the other hand it may vary based on the extensive editing, colored effects, complex equations, extra elongation of no. of pages of the article, etc. All manuscripts submitted to Advances in Pediatric Research should adhere to the journal's Editorial Policies and to these policies on conflict of interest, human and animal rights, and informed consent. Also, all manuscripts submitted to Advances in Pediatric Research should conform to the Uniform Requirements for Manuscripts Submitted to Biomedical Journals from ICMJE and the Principles of Transparency and Best Practice in Scholarly Publishing (joint statement by COPE, DOAJ, WAME, and OASPA). Submission of a manuscript to Advances in Pediatric Research implies that all authors have read and agreed to its content and that the manuscript conforms to the journal’s policies. Requests for permission to reproduce figures, tables or portions of articles originally published in Advances in Pediatric Research can be obtained via the Editorial Office. Manuscripts submitted to Advances in Pediatric Research should conform to “Uniform Requirements for Manuscripts Submitted to Biomedical Journals” from ICMJE. Manuscripts submitted to Advances in Pediatric Research should not contain material previously published in other publications, except as an abstract, and must not be currently under consideration for publication in another journal. Redundant publication is publication of a paper that overlaps substantially with one already published. When submitting a paper, authors should make a full statement to the editor about all submissions and previous reports that might be regarded as redundant publication of the same or similar work. Advances in Pediatric Research considers research and publication misconduct to be a serious breach of ethics, and will take such actions as necessary to address such misconduct. Authors should refer to the Committee on Publication Ethics (COPE) and the International Committee of Medical Journal Editors for full information. Statements, opinions and results of studies published in Advances in Pediatric Research are those of the authors and do not reflect the policy or position of the journal. Advances in Pediatric Research provides no warranty as to the articles' accuracy or reliability. Advances in Pediatric Research is pleased to announce that it has partnered with the CLOCKSS Archive and LOCKSS program to preserve its content in CLOCKSS's geographically and geopolitically distributed network of redundant archive nodes, located at 12 major research libraries around the world. This action provides for content to be freely available to everyone after a "trigger event" and ensures an author's work will be maximally accessible and useful over time. LOCKSS system has permission to collect, preserve, and serve this Archival Unit. CLOCKSS system has permission to ingest, preserve, and serve this Archival Unit.